A 1940s kitchen is full of color, texture and prints that can transform your kitchen. If you're looking for a retro design style for your kitchen but can't quite find the right one, a 1940s kitchen design is both fun and functional. Begin your kitchen transformation with this list of popular 1940's kitchen themes, colors and accessories. Bold, primary and vivid colors were very in during the 1940s. 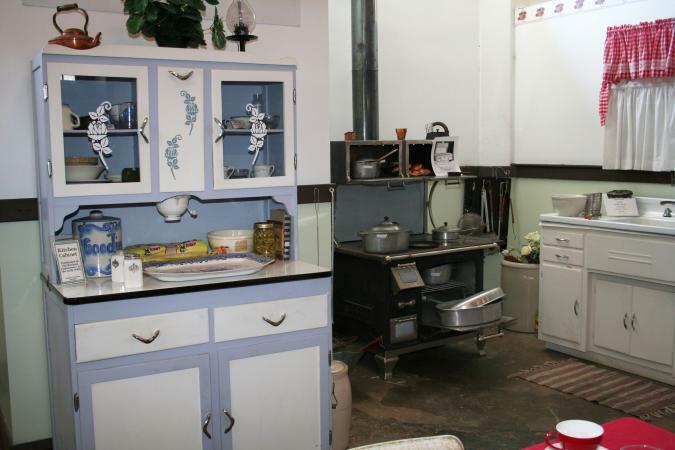 Two-toned kitchens were also very common. Many kitchens of this era used tile on the countertops - one color for the main area and a second as the border and trim. These same two colors were seen repeated in a checkerboard on the floor, in the curtains, the appliances and the wall art. Greens - Look for kelly green, dark greens or any shade in between. Here's a quick fun fact: Green paint was relegated to military use only during World War II; after the war, the color became extremely popular for everything from paint to fashion. Red and white - Bright cherry or apple red paired with crisp white was extremely popular in the 1940s kitchen design. Blues - Seek out Air Force blue and Navy blue. Yellow - Bright and cheery sunshine yellow was very popular in the 1940s. Add a few fun kitchen accessories to complete your 1940's kitchen design. Glass or acrylic knobs, colorful kitchen linens, enameled bread boxes and canisters are all great ways to add a little retro style to the design. Finish it off with window treatments decorated with red cherries, Gingham or a checked pattern, as well as some wall decor. Look for vintage hand towels to frame, or a favorite piece of art - it's totally fine to mix vintage and modern to get the look you want. The kitchen furniture of the 1940s set the stage for the furniture to come in the 1950s and 60s. Look for brightly colored chairs and bar stools, chrome and enamel. If you're working with what you currently have, consider painting your wooden chairs in bright, 40s colors like sunny yellow or mist green. Keep the wood tone of the table in tact; if possible look for tables that have chrome legs to finish the design. The appliances of the 1940s were typically enameled. White was a popular color for ovens, but other colors like blue, red and yellow were also popular. Try using appliance paint on your modern appliances to give them a more retro look of enameled white or red to help them blend in with the rest of your design. It's possible to update a kitchen with a little retro flair, or to completely redo a modern kitchen as a retro design. Visit these sites and shops to help find the goods you need to get it done. eBay - Check out the wide variety of beautiful vintage kitchen textiles at the website where you can find just about anything. Antique stores - When shopping for your 1940's items at an antique store, check the tag on the item, it will usually state the era in which the item was produced. Flea markets - Flea markets are a great way to find just about anything. Thrift stores - These are a great place to find anything old and new. Even if you find items that look like they are from the 1940's but are unsure, it doesn't matter, as long as the item fits into you design plans. Modern appliances finished in chrome fit perfectly into a 1940s themed kitchen, so don't be afraid to mix it up. 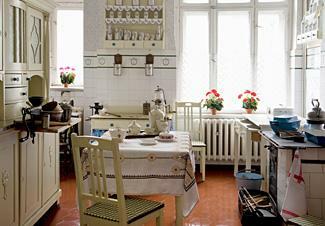 Vintage look appliances are also very easy to find if you are doing a major kitchen rehab. Shop around for these items though, they can get a bit pricey. If you are looking for authentic 1940s kitchen appliances, use them for decorative purposes only. The wiring in the items are not up to current codes and standards and may pose fire hazard and safety hazards. If you do find a piece that you love and want it to be both decorative and functional, consider taking it to an electronics specialist to have the item rewired. Consider purchasing a kitchen rack or shelf to display your collections of 1940's kitchen accessories. If you don't want to go "all out" in your 1940's kitchen decorating, choose a few major kitchen themes of the 40's and add other design elements that you love that may not be from that era. Just group together the main items in the design as a focal point before mixing the others in. Just keep a general color scheme throughout the space to help give it a cohesive look. The 40s were full of bold colors, modern appliances and materials and convenient living. Put your own stamp on a 1940s inspired kitchen by using these ideals as your framework and make a kitchen that truly works for you.